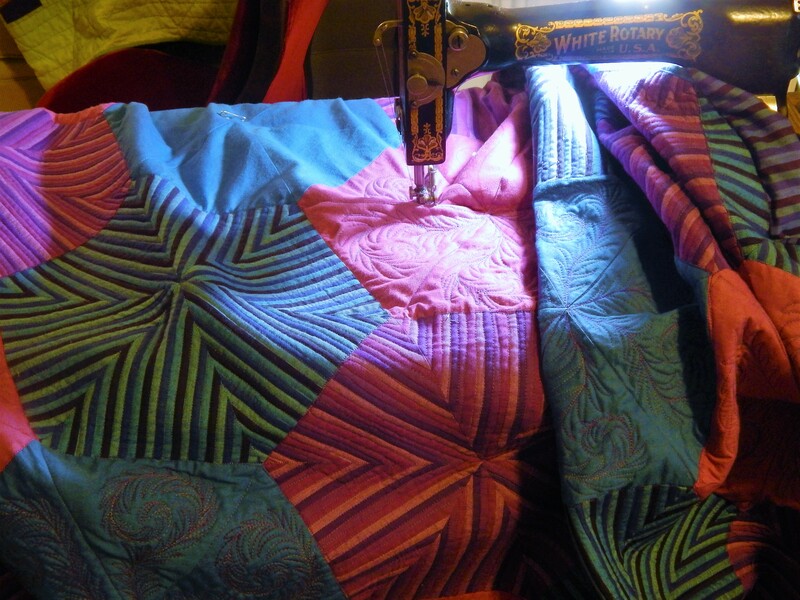 I use about 400 yards of thread on this quilt, and the quilting took about 10 days (between a few other projects). then cut at 2 1/2 ” and joined together. I cut it 2 1/2″ wide and folded it in half….then machine sewed it to the front, folded it to the back and hand stitched it to the backing. The “puffiness” comes from the poly batting. I felt that if it had been finished back in the year that it was started the original maker would have used poly. It was dark when I took the pictures but It just came out of the dryer and I couldn’t wait until morning to take pictures. Now back to work on the whole cloth quilt. 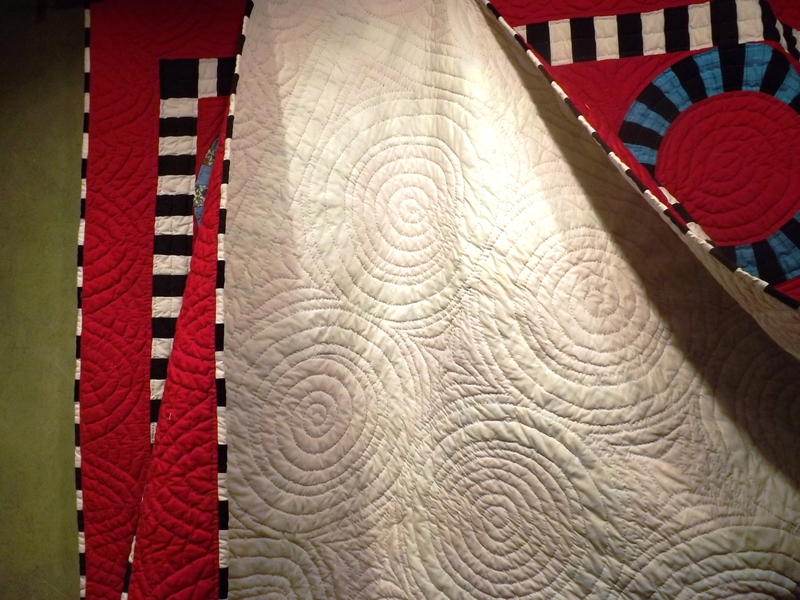 This entry was posted in Quilts and tagged hand quilting, Quilting, Quilts, single wedding ring quilt. It looks fabulous! What a great idea for the binding! thanks!….I really like the matching binding…but it is thick at the seams! thanks Kathi!! it is fun to do a fast one as a break from the more complex! Another winner! When is the auction for it? Let’s see…it took 10 hours to quilt it , or was that 10 days? 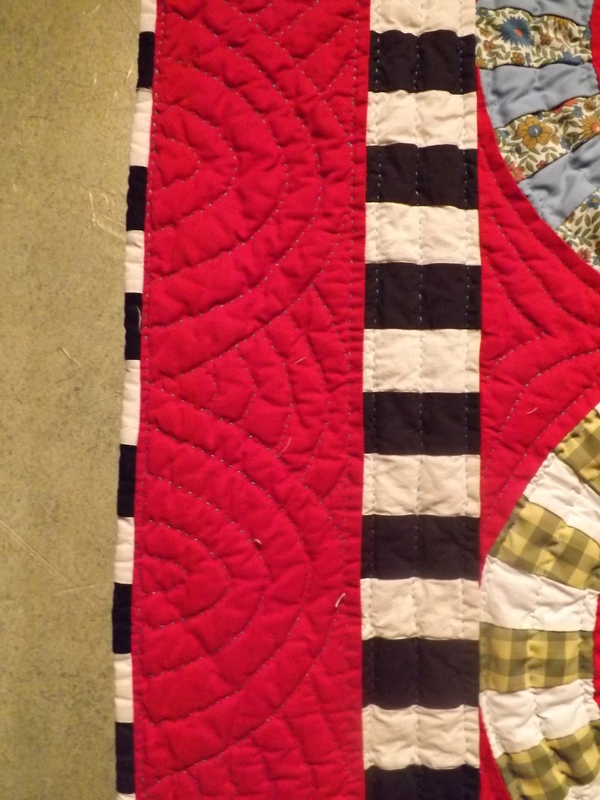 And it’s old and used…..hmmmm…….and you enjoyed quilting it so it’s not like you didn’t want to do it………….and it’s taking space in your house and Teddy probably thinks it’s in the way…………..
Masterful and very cool striped sashing and binding, Tim. I love how your quilting always enhances the quilt that much more. I especially like in this one your use of the stripes to bring it all together with the old blocks and unify everything. 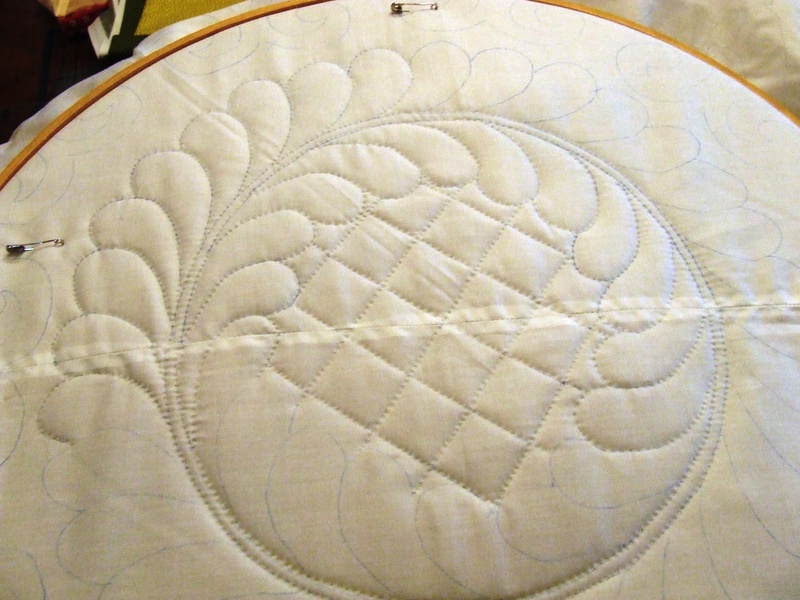 that is why I like to do big stitch quilting sometimes…it goes so fast! What a fun quilt, Tim. I am way impressed with how you lined up the black & white binding with the inner black and white border. Meticulous! And I love the poly batting for this quilt. Sometimes poly is just perfect. It looks incredible!! I’m astounded at how fast you got the quilting finished!! 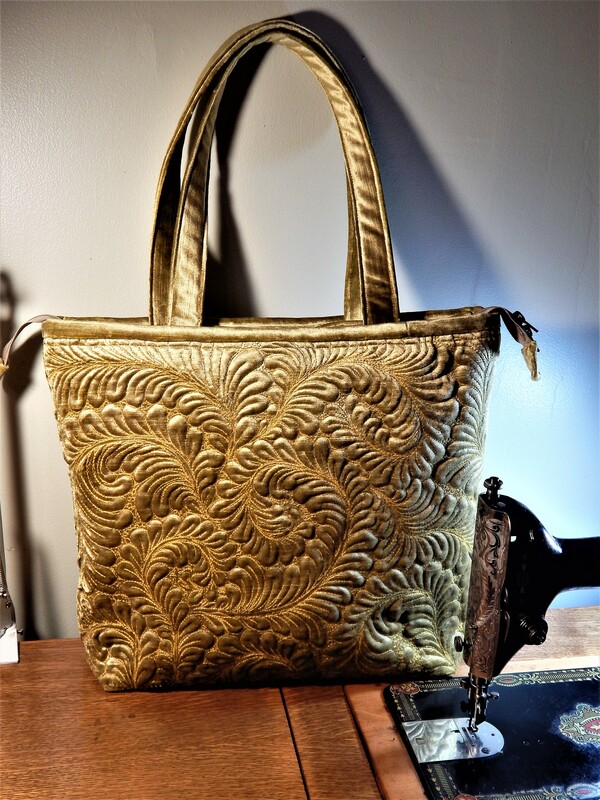 The binding makes for a fabulous finish. WOW! I wish that I could quilt that fast.. It looks great. I really love this quilt, I love the inner border, great choice to do that. wow…its a quilt that would make me smile everyday. Fabulous Tim! I just love it!! This is incredible. I love the bold colors and your big stitch quilting. Just beautiful. Stunning quilt! I see rings in my future . . .
this is really beautiful. We are so lucky to have you come to CAMEO quilt guild next year as a speaker. I have some Dresden blocks that were sewn by a great aunt on a sheet. I hope you can give me some ideas on what to do with them when you come. Your quilting is fantastic. Thanks….I look so forward to being there…..wonderful to have blocks that are from the family!….I know that they can be made into something great!…..I will have some ideas for you when I an there! 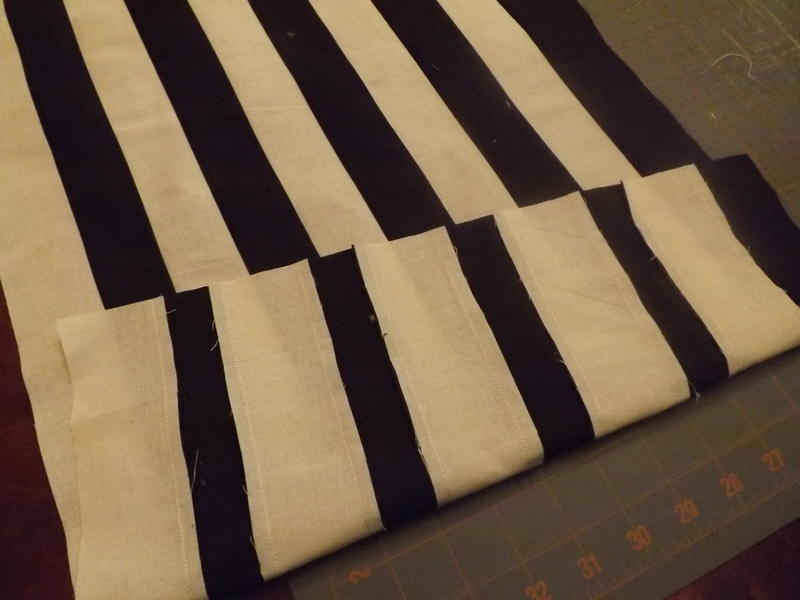 I love it–the stripe binding is the perfect ending! Great binding choice! I really love this quilt and the stitching is just perfect. Super finish. What a beautiful quilt! The binding really sets it off. Perfeccgt choice. What a beautiful quilt, Tim! And as always your quilting is magnificent! I think this pattern is much easier to make than the double wedding ring. There are less pieces. What a great graphic quilt. I love the bold colors and the striped binding finishes it off perfectly. Thanks Pat…..I had a lot of comments early on that the red was too much….I am glad I stuck with the plan! 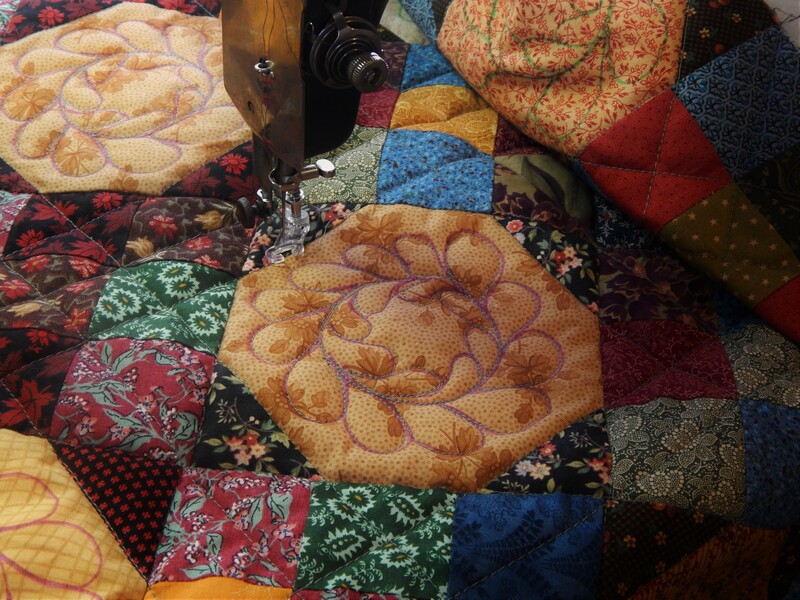 What lovely hand quilting on your entire blog! You do magnificent work! Love your trapunto video. Where do you find bulky #5 yarn? Thanks for your quick reply. I checked it out and got some at my local JoAnn’s yesterday. Can’t wait to try it on the whole cloth I am doing! Bloody hell Tim! Do you SLEEP? Simply beautiful quilting and quilt!! Another gorgeous Tim quilt! Yes, you are a machine; but we can tell that this is a passion and the results show so very well. I am working on a busy quilt and might just do the big stitching on it. Thanks for the video. Love the quilts and flowers!! This quilt is so fun and sparkly. Love it.